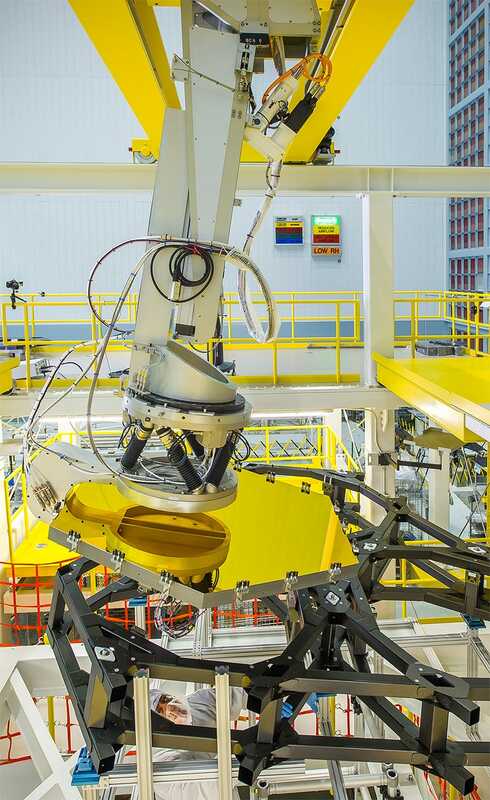 James Webb Space Telescope is the first space telescope where the primary mirror is made of individual segments, each individually controlled to ensure perfect alignment. The mirror will fold up during launch, then unfold in space like an origami flower. The telescope team built the Primary Mirror Alignment and Integration Fixture to lift, position, and lower each mirror segment. One team of engineers manoeuvres the robotic arm, while another team takes laser measurements to precisely determine location. All locations are determined with respect to retroreflectors mounted to the frame of the telescope. Once the segment is in the right place, they bolt and glue it in position before moving on to the next segment. We’re in love with the James Webb Space Telescope, tracking each step of testing the mirrors, getting them polished, and now finally installed. Once complete and launched, the infrared telescope will be the most powerful space telescope yet. It will be used in part to characterise exoplanets in the ongoing search for life beyond Earth. You can watch telescope assembly (including placing the mirrors!) on a webcam live.